As I watch my kids look for their lost tennis ball in the hedge, I am suddenly reminded that it will soon be time for Wimbledon. It’s a sporting event that’s been on my ‘to do’ list for years but have never got around to going to. Wimbledon was founded on 23 July 1868 as The All England Croquet Club. Today, it’s known as The All England Lawn Tennis & Croquet Club Limited (AELTC for short) and has a remarkable 27 registered trade marks in the UK alone. The first of these was registered in 1884 and is still in force today. And in essence, that it what registering a trade mark is all about - establishing a brand and ensuring that customers recognise your products and services from those of other traders. Once registered, a trade mark lasts 10 years before it needs to be renewed. But it’s not just Wimbledon that flaunts their trade marks during the tournament. There are also several official suppliers associated with The Championships. Slazenger have had a long successful relationship with the club since 1902. They will supply 52,000 tennis balls for the tournament this year. Likewise, Robinsons, have an association with The Championships since 1935 with their Lemon Barley Water which is the official still soft drink. And of course, other trade marks and labels can be seen from the player’s multiple sponsors. All advertised to a global audience of an estimated 1 billion and all established brands which are effortlessly identified in the blink of an eye by their registered trade marks. 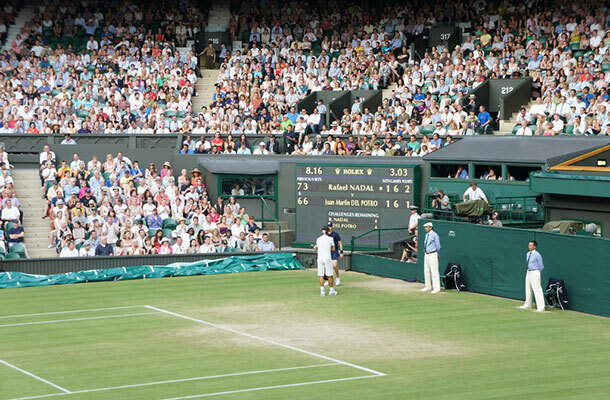 With 490,000 people attending the event and viewing figures of 10 million for last year’s epic final between Novak Djokovic and Roger Federer, there is little doubt why companies spend so much money to get the top players sporting their trade marks. Reaching the Wimbledon final 9 times and winning 17 Grand Slam singles titles, Roger Federer draws an extensive amount of media attention. His status as an iconic athlete makes it easier for us as consumers to relate his skill and success to these brands. We choose them because we associate them with the very best high quality performance. So what is it about this championship that entices all of these viewers and attendees to the 14 day event? Surely it isn’t the promise of seeing what brand is emblazoned upon Andy Murray’s shirt. Still, there is little doubt that the tournament is one of the most prestigious events of the British sporting time table if not the world. With associations to the Royal Family and Her Majesty The Queen being the clubs patron, could it be that there is just something quintessentially British about it? With prize money of £1.76 million awarded to both the men’s and women’s single champions in 2014, I may consider entering as a wildcard myself this summer.